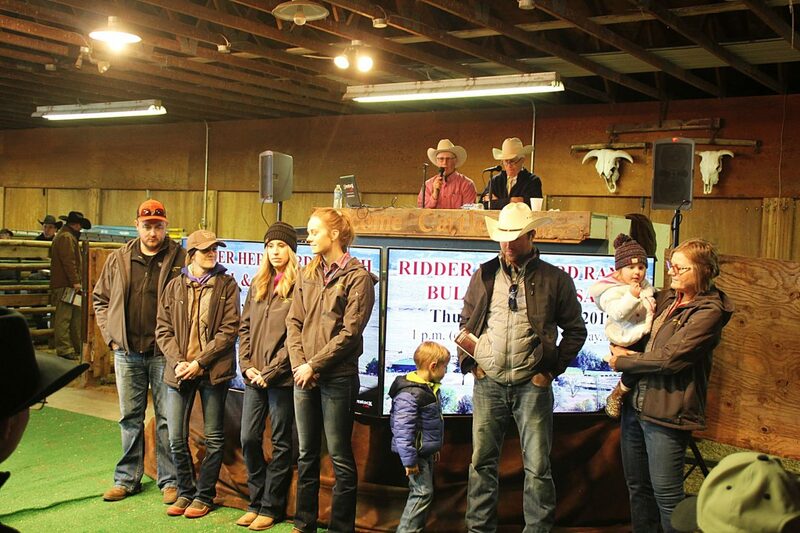 Ridder Herefords is a family operation. Homesteaded in the Calloway, NE area in 1907. 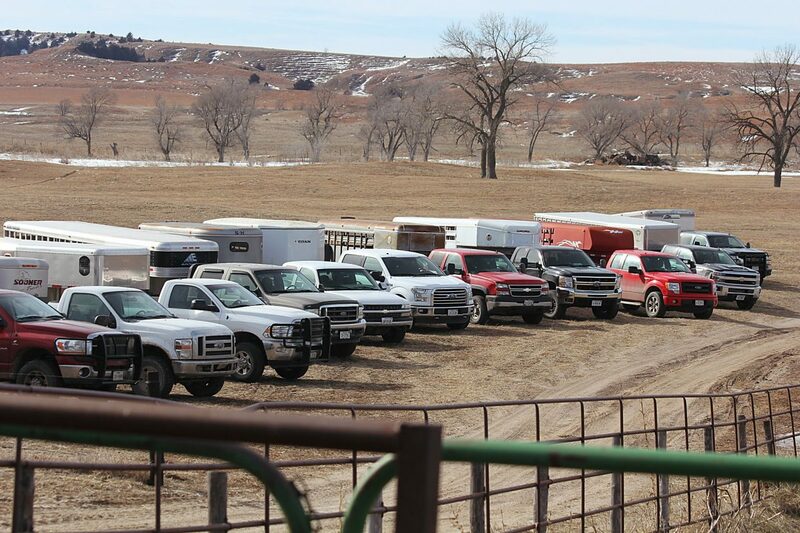 Many buyers planned ahead and brought their trailers to haul home a new Ridder Hereford bull or heifer. 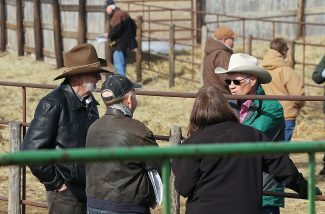 Sale host John Ridder, talking bulls in the pens. 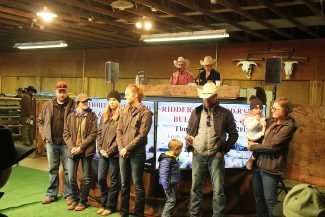 Ridder Hereford Ranch hosted their annual production sale in their sale barn and via Superior Auctions for their North Star Bulls and Starlette heifers. 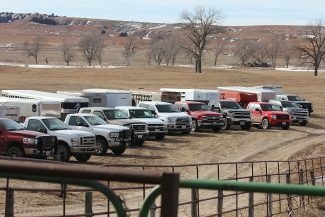 This is the Ridder family's 112th year of ranching west of Callaway. Topping the yearling bulls was R 4105 North Star 42F, selling for $10,000 to Jerry Knippling & Sons, Gann Valley, SD. R 5184 North Star ER 10F sold for $9,000 to Ron Struempler, Oconto, NE. R 4105 North Star 29F sold for $8,000 to Don & Kevin Klein, Roseland, NE. High selling two-year-old bull was R 330A North Star 107E, selling for $9,500 to Ted Johnson, Raymond, NE. R 3203 North Star 59E sold for $9,000 to Jack Engelhaupt, Butte, NE. R 0141 North Star ER 52E sold for $7,000 to Randy & Clint Bentley, Miller, NE. Topping the heifer sale for $2,100 was R Starlette 803 selling to Joe Ridder, Holdrege, NE and R Starlette J 804 to David Morehead, Bernard, IA. Both heifers were out of KB L1 Domino 623D. Selling for $1,900 were R Starlette 703, also out of 623D, to Dan Albrecht, North Platte, NE and R Starlette 878, out of HH Advance 4067B to Daryl Crook, Rising City, NE.